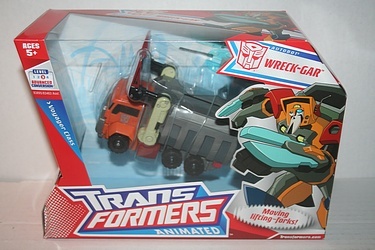 In one of the most brilliant voice casting moves ever executed, Susan Blu got 'Weird Al' Yankovic to provide the voice of Wreck-Gar in two episodes of the Transformers: Animated cartoon. Why is this amazing? Well I think I have previously pointed out, but it's always worth doing so again, that in the 1986 Transformers movie, Wreck-Gar (as voiced by Eric Idle) has a most excellent action montage set to the 'Weird Al' song 'Dare to be Stupid'. Just brilliantly done on her part, and a real gift to the long time fans. I just dug this excellent Transformers: Animated voyager figure out of a pile of 'product' here at the Preserve, and realized that he never had made it into the archives. So, here he is! Click the image for more shots and his bio. Offer expires while you wait, operators are standing by.